I had leftover rolls/roll bits in the freezer for a loooong time. I don’t really care to saw how long because it would sound really unappetizing. A waterpolo potluck came up and I saw a window of opportunity to use this frozen bread! 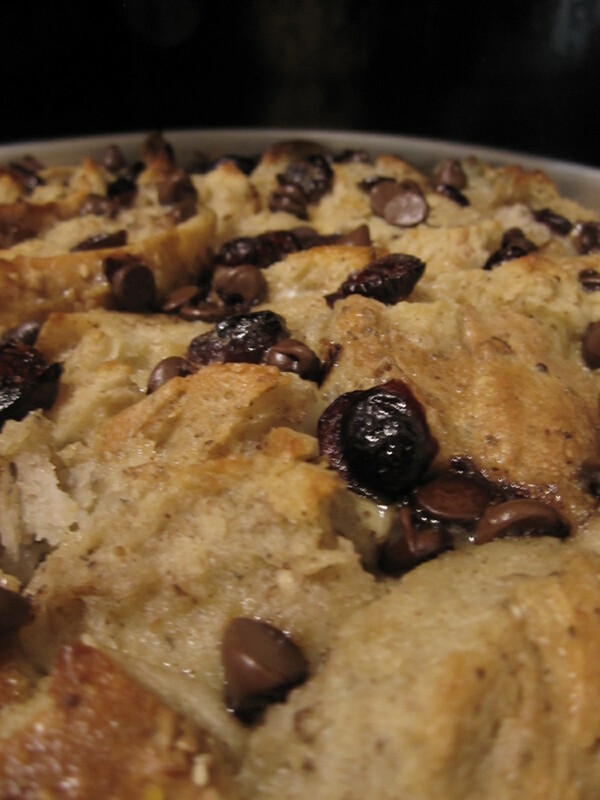 Bread pudding is delicious, no question about it. What I love even more is that uses something you could say is ‘past its prime’ and turns it into something so scrumptious you would never know it. I’m come away from this learning that bread freezes very well. I tasted a bit just to make sure it wasn’t awful and it tasted like bread. I actually had to stop myself from eating too much to be honest. There were a few really dried, fridge tasting bits around the edges and it just ripped those off. 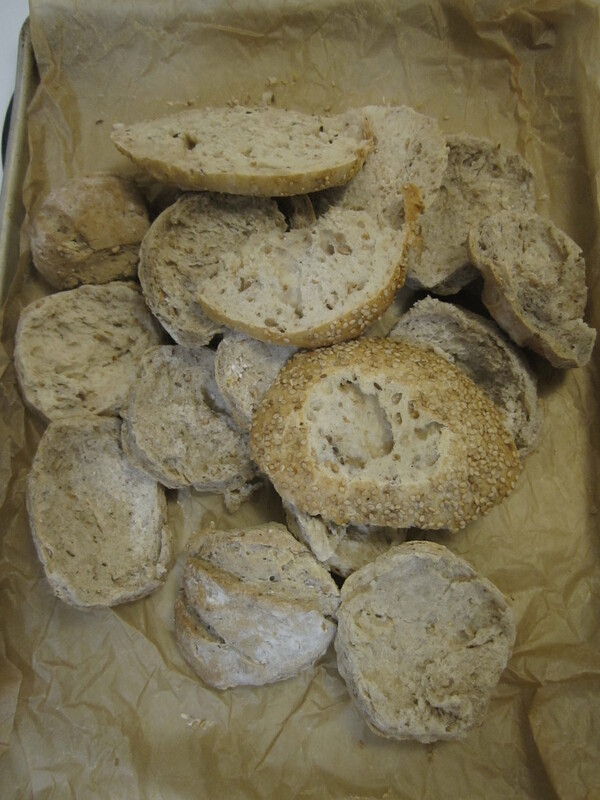 2) Rip up the bread into small pieces and put into a pan. The original recipe uses an 8×8 square baking pan and I used ~10inch round baking pan. I figured I had about 1 1/2 times as much bread as the original recipe used so I scaled things accordingly. 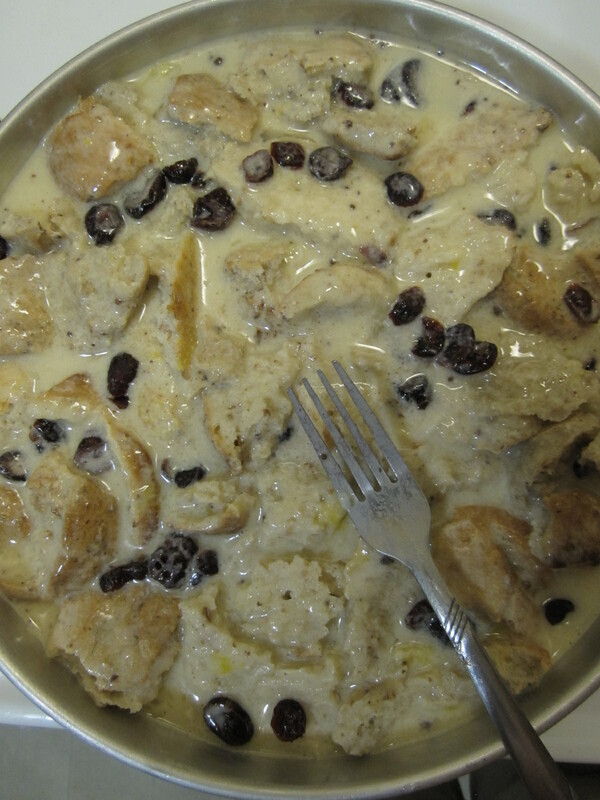 3) Drizzle the melted butter over the bread and sprinkle the dried cranberries and chocolate chips on top. 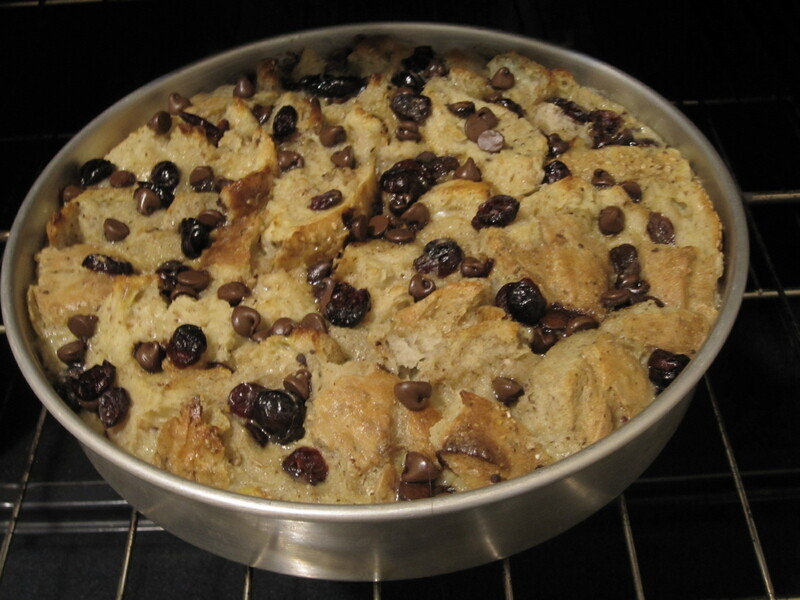 4)Mix the remaining ingredients together in a bowl and pour over the bread in the pan. Use a fork to poke the bread around to make sure it all gets coated. I kinda turned them over and it also helped to get some of the cranberries and chocolate mixed in. 5) Bake for about 40 minutes or until the top is springy when poked at. Isn’t she a beauty??! The outside is crispy and tastes more like bread, but you dive into the center and it’s a custardy goodness that melts in your mouth! It was almost finished at the potluck I went to. There was just enough for me to eat the rest for breakfast this morning =). My friend who doesn’t like bread pudding even said it wasn’t so bad. I’m not sure it took me so long to make this but it’s finally done! I will definitely be making it again.